Join the discussion on our forums! Come discuss Arena Patron over in our dedicated Arena Patron discussion topic. 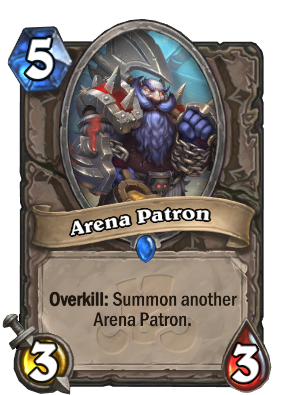 Overkill: Summon another Arena Patron. Everybody with a ticket get in here! You must construct additional pile ons. Magma Rager is no longer the worse card in game. I didn't think Blizzard could make a card stat'ed worse than Vilebrood Skitterer, but WOW, do they aim to surprise. Over-priced, high-risk, low-value return on successful proc. Dust on the spot, without hesitation. But the summoned minion has overkill again? I love this artwork. He just looks like an improved version of Grim Patron and his armor shows he likes Akali's Rhinos. Which fits with his past. Love gimped versions of good cards. Basically, this card will probably be the shining example of how bad Overkill can be. This is just a nostalgia play type of card...it's really really bad otherwise. True to his title, the only place he's ever gonna probably see play is the Arena. Damn meme card. Just a fun callback to the actually good card. There is gonna be a Warrior 2 mana 1/1 give your minion rush. Houndmaster Shaw is the closest thing we’re gonna get to old Patron shenanigans. I’m okay with that. A single tear dropping. Not seeing this as really playable tough. would be great if there was a way to give minions with 3 or less attack charge.